The Center for Media Justice | “A Lifeline for Families”: Advocating for Prison Phone Justice in D.C.
“A Lifeline for Families”: Advocating for Prison Phone Justice in D.C. Rallying support behind the Inmate Calling Technical Corrections Act (S.2520), the Center for Media Justice and members of our Media Action Grassroots Network – including Urbana-Champaign Independent Media Center (UCIMC) and the Ella Baker Center for Human Rights – joined other criminal justice reform leaders for a Prison Phone Justice advocacy day at the U.S. Senate yesterday. The targeted bill, co-sponsored by Senators Duckworth, Booker, Portman and Schatz, would ultimately address key needs to eliminate predatory inmate calling rates nationwide by restoring the Federal Communications Commission’s authority to protect all consumers. To kick off the day, former FCC Commissioner and longtime prison phone justice advocate, Mignon Clyburn, reminded the delegation that maintaining strong relationships between families and their incarcerated loved ones is pivotal to safe and successful reentry into society. Unfortunately, due to high costs low-income families incur to support a loved one in jail or prison, 2 out of 3 families must decide between meeting basic needs, such as purchasing groceries, and speaking with their family behind bars. 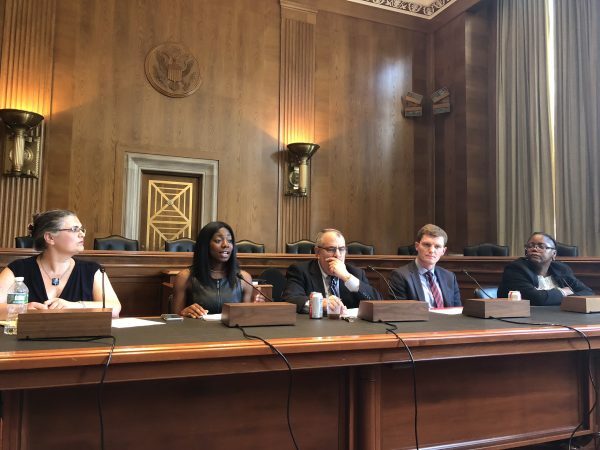 “When prison phone calls are affordable, there’s a huge impact on families”, said Myaisha Hayes, a National Field Organizer at the Center for Media Justice, during the delegation’s conversation with South Dakota’s Senate Commerce Majority about the positive effects of continuous, strong connections between families and incarcerated loved ones. The advocacy day culminated with a lunch briefing to further discuss the urgency needed to usher in prison phone justice via S.2520 and how high the stakes are for individuals, families and entire communities that are negatively impacted by broken bonds. In the videos below, Tunisia Owens from the Ella Baker Center for Human Rights and Wandjell Harvey-Robinson from UCIMC share their perspectives and call-to-actions to bring about prison phone justice in communities across the country.